Welcome to the new season of concerts presented by Music for Everyone. Our programme covers the full range, from intimate chamber performances to thrilling, large scale choral and orchestral concerts with top soloists. 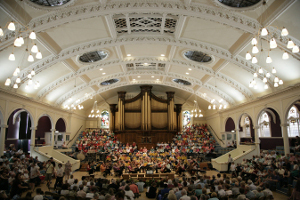 Many of our concerts take place in the elegant setting of Nottingham’s Albert Hall, where you can feel closely involved in the music. As ever, there will be a strong sense of occasion, a buzz of excitement, giving a real edge of active pleasure to the performance. No other concert series offers you such consistently high standards of performance across such a range. Many big-name composers are included in our programmes, alongside artists or works which may be new to you – come and discover! … about the East of England Singers: Always noted for their dynamism, they surely exceeded even their reputation for razor-sharp ensemble and musical muscle. … about the Nottingham Festival Chorus: First-class choral singing, well balanced and with a depth of understanding which brought every line of the texts to life. … about the East of England Singers: Wonderful, stunning – a real triumph of a programme! I was moved to tears at times by the exquisite sounds. The sound of the choir was so beautiful, as was the orchestra, and the soloists were so good. I was so moved by the whole performance. Thank you. … about the Nottingham Festival Chorus: We had a wonderful time. There was such a variety of music and all of it at such a very high standard. Many thanks to everyone involved with all the planning & rehearsing. The hard work was much appreciated and the result fantastic.